This entry was posted on Sunday, March 31st, 2019 by Frances Ryan. I have enjoyed a lovely adventure day out to Fife with a friend today, which has left me both energised and exhausted all at once. But I do admit that I like the feeling of a well-earned exhaustion! The primary reason for the trip was for my friend to look at a lovely wee motorhome that she wanted to purchase. But if you’re driving all the way to Fife, you might as well enjoy the scenery. Which is just what we did. So, after my friend shook hands and signed a bit of paper for her new rig, it was off adventuring for us! Our adventure began with a visit to the village of Elie and Earlsferry where we enjoyed a nice fish and chips lunch at The Ship Inn. From there, we walked down towards the water for a walk along the Fife Coastal Path. At the start of our walk, we stopped by Lady’s Tower near Ruby Bay. 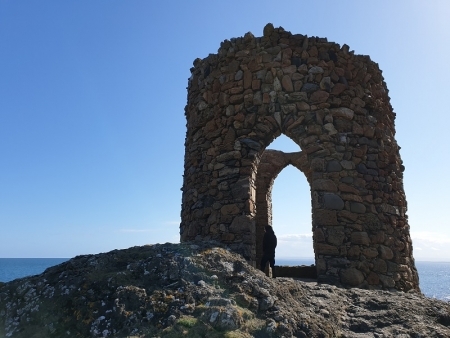 The tower was built in 1760 for Lady Janet Anstruther who used it as a changing room for her morning bathing routine (which was skinny dipping, apparently), and overlooks the bay. From there, we began our walk along the coastal path towards St Monans, three miles to the east. Along the way, we collect a bit of sea glass and passed by a couple of old ruined castles. The first set of ruins we came upon were those of Ardross Castle. The castle was built in the mid-1300s and is half-way between Elie and St Monans. Today, the ruins are little more than a couple of crumbling walls that are slowly being engulfed by nature. Most of the stonework has been removed for use on other buildings in the wee hamlet of Ardross. Further along the path, we passed by the ruins of Newark Castle which began its life in the 1200s. Located just outside of St Monans, it is in a very fragile state, crumbling along the shoreline. The building is surrounded in fencing to keep people away from the dangerous structure, which really only made me want to see it even more! But I daren’t risk injury, so I had to refrain from sneaking beyond the barriers. The next site we passed by was the doocot at Newark Castle. The traditional beehive-shaped structure seems to be in quite good condition, although the door was looked so I couldn’t peek inside. Which is a real shame, because I do love a nice doocot! Not long after passing by Newark Castle, we approached the village of St Monans where the ancient kirk sits along the edge of water. The kirk has roots that date back to the 800s, but the current building is "new" from the 1300s with the ruins of an older church structure nearby. From the kirk, we made our way away from the coastal path and into the village where we refuelled with tea and scones. Afterwards, we retraced our steps back towards Elie with a quick stop at the Ardross farm shop. It was a long day, and there was much more walking than I had anticipated. But it was also a good day filled with lots of sunshine, chit-chat, and laughter! Now, to rest up for my next adventure!